One of the coolest new features included on the Razer Phone 2 is the ability to customize the colorful Chroma Razer logo prominently located on the back of the device. You're able to illuminate the logo with practically any RGB color you want, and it's a great party trick to show off to your family and friends that takes very little effort to set up. Tap Main Chroma Effect to see your customizing options. You will see the color wheel along with some icons at the bottom. To change the effect, tap the Effect icon in the bottom right corner. It looks like two waveforms slightly out of sync. Spectrum which cycles through the RGB rainbow at a static glow. 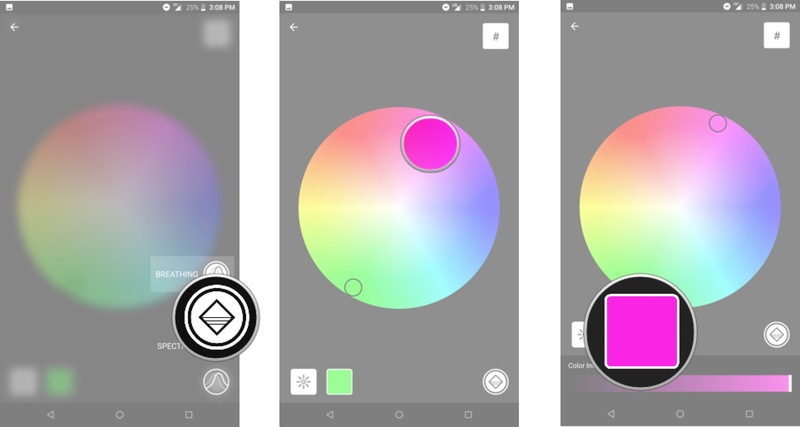 Tap anywhere on the color wheel to select a custom color. One tip for preserving battery is to stick with pure shades of red, green, or blue. You'll see the selected color in the Color Intensity box below the color wheel. 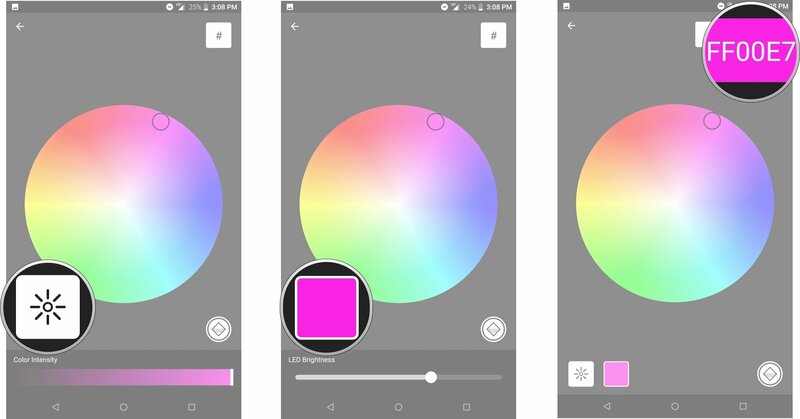 You're able to change the color intensity with the slider at the bottom. Alternatively, you can tap LED Brightness to switch the slider to control the intensity of the light. This is a very important setting if you always want that Chroma glow on but still care about battery life. Another neat feature is the ability to enter a hex color code for a precise color match by tapping the hex symbol icon in the top right corner. Beyond the controls for the Chroma effect, Razer gives you three quick settings for controlling the overall brightness. High definitely looks the best, even in direct sunlight, but will noticeably reduce your battery life if on for a whole day. Medium is slightly dimmer and, therefore, better for everyday use if you still need a day's worth of battery life. Low is best if you'd rather not waste battery on the Chroma when you're using your phone. It minimizes the effect, but you can still fire up Chroma for app notifications. If you really want to take things to the next level, you can also get the official Razer Phone 2 Wireless Charger which sports a ring of Chroma LEDs around the base of the charging pad. 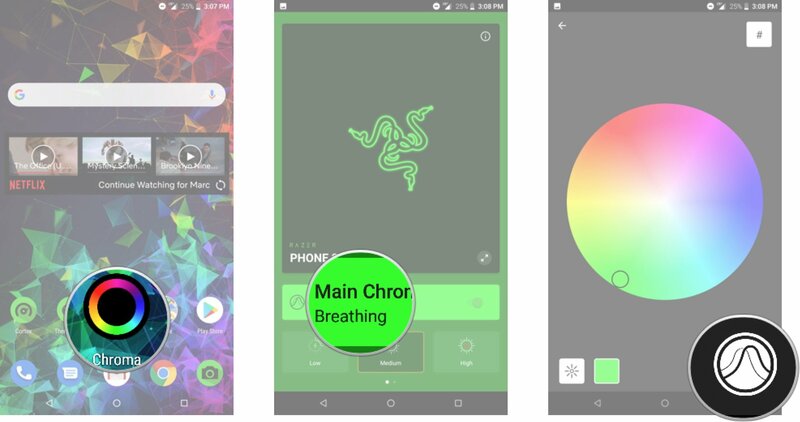 You pair the charger and customize the Chroma effects to match that of your phone using the same Chroma app used above! Why, yes, it is total overkill, but isn't that the point? Razer is bringing RGB to Android in a big way, with its Razer Phone 2 and accessories. A refined gaming phone for a refined gamer. The Razer Phone 2 is an impressive smartphone that's designed with gamers in mind. 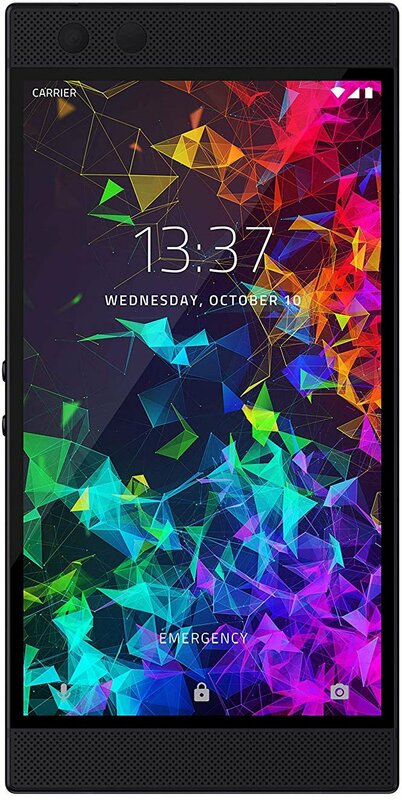 It's got the latest Snapdragon 845 processor, 8GB of RAM, a massive 4000 mAh battery and a screen that will make you weep at the loveliness of its 120 Hz refresh rate. Razer has added its own software touches to this mostly stock version of Android 8.1 Oreo, including great performance tweaking for mobile games and full control over the Chroma RGB logo on the back. This is a good follow up from one of the newer tech companies to get into the smartphone business, and it's worth serious consideration for your next phone. The Razer Phone 2's Chroma effects are good fun in their own right, but if you're also in the market for a wireless charger, you should consider this one from Razer. 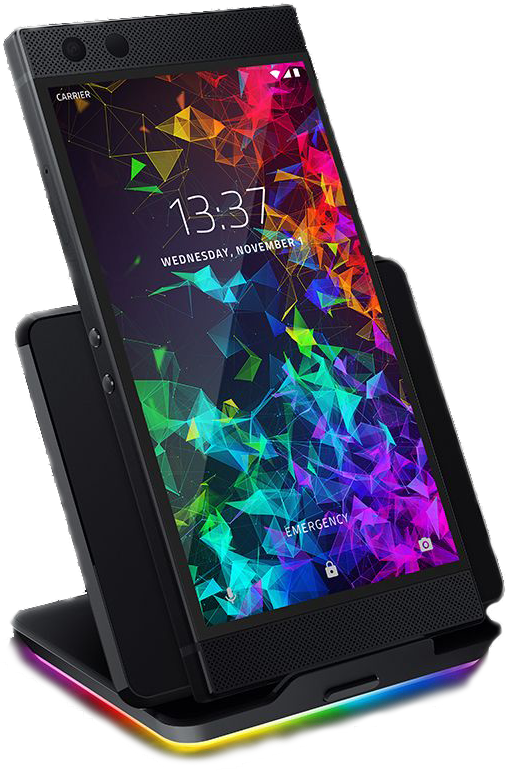 It's a bit more expensive than other third-party wireless charging accessories, but you'll appreciate how it's designed to work specifically with the orientation of the wireless charging coils on the Razer Phone 2. Plus, you can put on a Chroma light show with the RGB LEDs that encircle the charger's base, synchronized with your glorious gaming phone. Razer's charger looks great and is specifically designed to match up with the Razer Phone 2's wireless charging coils. Get more Chroma in your life!